The Interstate 105 (I-105) corridor experiences heavy demand that exceeds the freeway’s capacity, and projected growth is expected to place even greater demands on the corridor. 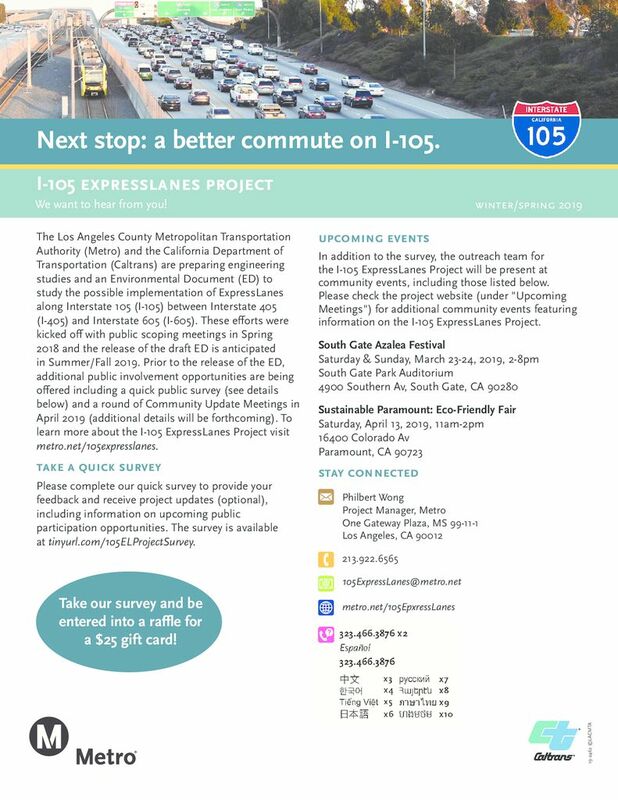 As a result, the Los Angeles County Metropolitan Transportation Authority (Metro) and the California Department of Transportation (Caltrans) are preparing preliminary engineering studies and an Environmental Document (ED) for the possible implementation of ExpressLanes along I-105 between Interstate 405 and Interstate 605. These efforts were kicked off with public scoping meetings in Spring 2018 and the release of the draft ED for public review is anticipated in Fall 2019. Please join us for Community Update Meetings to learn more about the project on Wednesday, April 10 at 6:00pm. Discussion items will include an update on the alternatives under consideration, possible design features, the traffic and revenue study, environmental considerations, and the concept of operations.